That’s probably the best way to describe the look of Sandra Gautt as she wandered among the 45 posters and the dozens of people at The Commons in Spooner Hall. 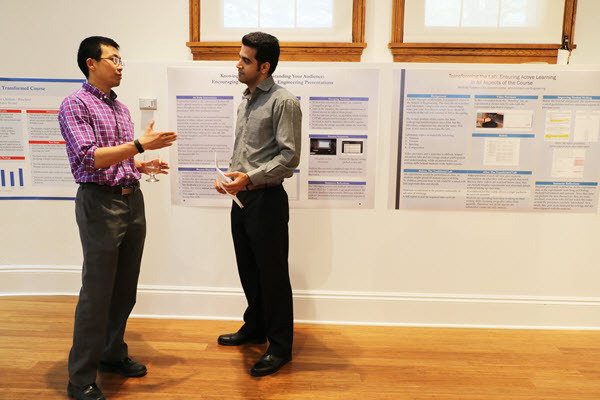 Xianglin Li and Moein Moradi from mechanical engineering discuss the work that went into their posters. 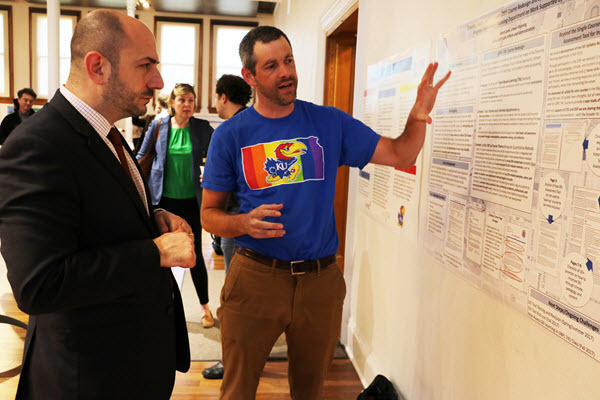 Gautt, former vice provost for faculty development, returned to KU for CTE’s third annual end-of-semester poster session on teaching. More than 40 instructors from more than 30 departments contributed posters, demonstrating the work they had done over the past year transforming classes to make them more student-centered, adding elements of diversity and assessing student learning more meaningfully. 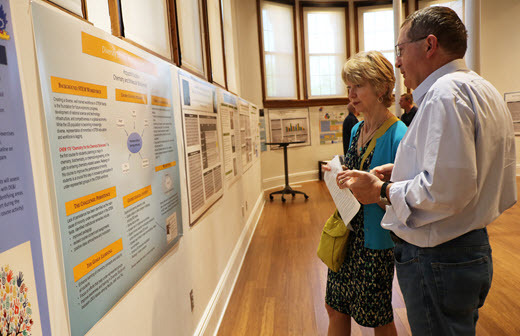 The poster session represents work faculty have done thanks to course development funds from CTE, the Provost’s Office and a KU grant project called Trestle, which is funded by the National Science Foundation. Gautt led the Teaching Commons Committee in the early 1990s and helped establish CTE in 1997. 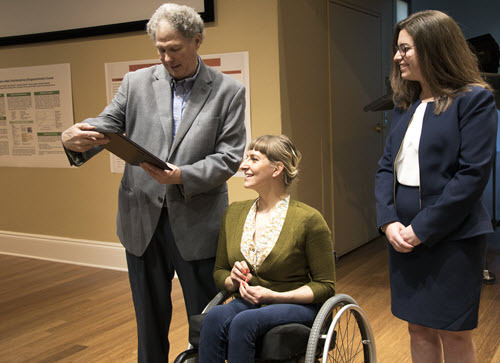 She said she never imagined that an idea for building community around teaching could turn into such a vibrant and diverse demonstration of intellectual engagement. It has, though. As CTE turns 20 years old this year, the poster session represents just one of many ways that teaching has gained in importance over the years. Joseph Brennan and Missy Shabazz from math explained how they have begun moving calculus courses toward a flipped model that provides increased incentives for participation. Lin Liu, Carl Luchies and Mohammedmoein Moradi from mechanical engineering explained development of interactive learning modules to help students gain a better grasp of physics and math concepts they need in an introductory mechanics sequence. Pam Gordon from classics explained changes she made in testing that provided better comprehension and understanding of the grammar of ancient Greek. Sharon Billings, David Fowle, Amy Burgin, Pamela Sullivan, Terry Loecke and Dan Hirmas explained how they developed an interdisciplinary course in biogeochemistry. Nancy Brady and Kelly Zarifa from speech, language and hearing explained a shift from an exam to a midterm project to aid student learning. Trevor Rivers, Mark Mort and Stefanie DeVito explained how they had worked to create consistency in a biology course at the Lawrence and Edwards campuses. Those are just a sampling of the work being done in such areas as geography, biochemistry, math, engineering, music therapy, physics, music, psychology, biology, African and African-American studies, journalism, philosophy, law, English, social work, design, chemistry, art and business. They give a good sense of the types of work faculty members are doing as they focus on student learning rather than delivery of content. The needs of students and society are changing, and our teaching must change to meet those needs. Teaching needs constant re-evaluation and reflection if we want courses and instructors to improve. Teaching should be more open and collaborative, allowing instructors to learn from one another by sharing insights and challenges, and working toward shared goals. Communities provide effective vehicles for change, and the communities we have built around teaching have indeed led to important changes at KU. Teaching is intellectual work on par with research and deserves equal weight in the promotion and tenure process. That’s certainly reason for pride. Tagged C21, course transformation, evidence-based teaching, reflective teaching, scholarship of teaching and learning.